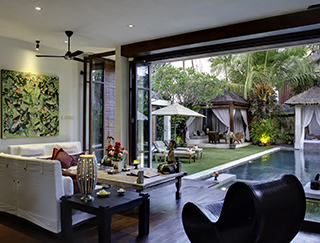 The versatile design and layout of the three villas at Majapahit allow guests the convenience of choosing any combination of bedrooms to suit, be it a honeymoon couple, a small family of four or a large group requiring ten rooms. 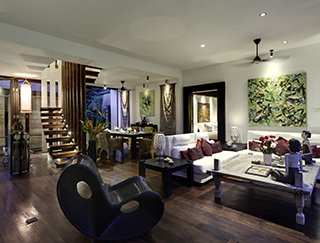 Securely situated within a three-villa enclave, Villa Nataraja comprises a three-bedroom, two-storey house and private walled garden complete with 12-metre swimming pool. The master bedroom is situated upstairs while the two guest bedrooms are positioned downstairs flanking the fan-cooled living/dining room, which opens directly to the pool and garden. A notable feature is the double jacuzzi that extends into the living space and overflows into the pool. At the far end of the pool is a massage pavilion and in one corner of the garden is a large balé relaxation pavilion.